This kicks off the Acts of Vengeance side arc thing stuff. This is the late 80's early 90's version of Marvel NOW! They take a bunch of heroes and villains and shake it up a bit, and it starts with a party! Peter Parker and MJ have finally moved into their new apartment and are celebrating with all their family and friends. The party goes sour real quick when MJ receives room service and a note all coming from a Jonathan Caesar! For those of you who don't remember, Caesar is the guy who kidnapped MJ and tried getting her to marry him. When Spider-Man stopped him, Caesar vowed to destroy her career, even all the way from jail. Which is why MJ couldn't land a job for a long while. Some consoling from her loving husband Peter, and the party is right back on, MJ is feeling better and everyone can continue with their festivities. Later that night the party comes to a close and Pete leaves with Flash and a friend Sam on a walk through the city. Pete branches off by the Bugle and stops in to see if there's any assignments, and shocker, there aren't. What else is new? Maybe Spider-Man can get some better luck and score some pics. Later that night, a strange figure comes flying toward the city. And not like, cool Superman flying, no he's vertical and just floating. I don't know, its kind of weird. He came into a no fly zone and was approached by a helicopter, something he dealt with very quickly, crushing the chopper and tossing it aside. This vile villain is known as Graviton, who has control over the gravitational forces of everything in his path. And one of the many things in his path is the Daily Bugle building, which he makes a visit to the following day. He knows that's where the pictures of Spider-Man get taken and he's after the spider so what better way to get the spider's attention than attacking the people he loves? Yeah, what villain doesn't think that? Peter was just checking in at his lab at Empire State University when he notices the Bugle half way in the air! A quick change of clothes and Spider-Man is off to save the day yet again! The fight is long and hard, this new foe is one like Spider-Man has never faced before. Filing cabinets become traps for the spider, floor panels are traps for the Wall Crawler, everything is a new weapon against our hero this time around! 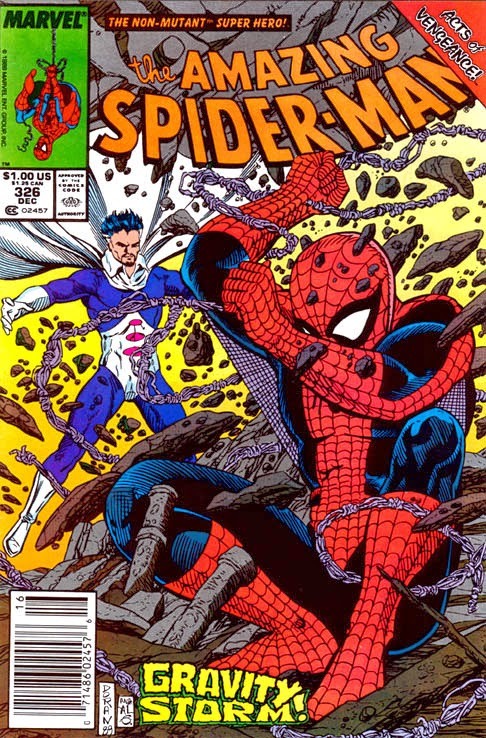 Things get real tough when Graviton sticks a guy to the ground and starts sliding a huge filing cabinet right at him, Spider-Man doesn't have much time to do anything, and gets the poor guy loose at the very last second. Graviton brings the entire building down and makes his escape as the cops show up. Spider-Man crawls out through the rubble and everything is alright. No one is hurt, no one is dead, but the day isn't neccessarily won. The bad guy is gone, and there's tons of property damage. Seriously, who pays for all this?! Anywho, Peter comes home to his wife waiting for him, they have a nice candlelit night as this issue comes to an end. It was very tough reading this issue and not having McFarlane at the pencil helm, honestly, this artwork was straight up weird. Looking back at Harry Osborn's baby, it was by far the creepiest baby I've ever seen in my entire life. The writting was still strong though, I'm really starting to hold Michelinie up on my favorite Spider-Man writters list. There's only a couple issues left, a couple more in this Acts of Vengeance era thing arc stuff thing dude guy. Anywho, be back in a week for another thwiptastic issue of The Amazing Spider-Man!